Each new print copy includes Navigate 2 Advantage Access that unlocks a comprehensive and interactive eBook, student practice activities and assessments, a full suite of instructor resources, and learning analytics reporting tools. 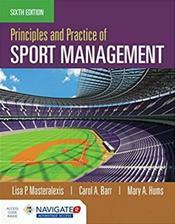 ...Updated and revised with the latest data in the field, Principles and Practice of Sport Management, Sixth Edition provides students with the foundation they need to prepare for a variety of sport management careers. Intended for use in introductory sport management courses at the undergraduate level, the focus of the Sixth Edition is to provide an overview of the sport industry and cover basic fundamental knowledge and skill sets of the sport manager, as well as to provide information on sport industry segments for potential employment and career opportunities.